Dubai: World Cup contender Dolkong has more to win than millions in prize money if he turns up at the post ahead of everyone else in Saturday’s feature race at Meydan. Success for the five-year-old son of Afleet Alex in the world’s richest race could have far reaching positives for South Korea, the country he represents, according to his Australian conditioner Simon Foster. Dolkong has improved comprehensively and his third-place finish behind Capezzano in the Al Maktoum Challenge R3 on Super Saturday has made him the toast of the Far East Asian nation. South Korean racing enthusiasts will tune in live when he takes his place in the stalls for the $12 million Group 1 Dubai World Cup, which has a post time of 8.40pm. It will be 1.40am in South Korea, but that won’t deter the locals from staying up in support of their nation’s flag-bearer, who will run in the biggest race of his life. “I probably miss [all of the emotion] a little bit because I cannot understand the language or read it but I get updates,” Foster said after watching his charge go through the paces at Meydan yesterday. “They had a race named after him on Saturday in Seoul and it’s very rare that they name a race after anything. “So it’s a big honour for them and they’ve got a few banners around the racecourse for him and there’ll probably be a bit more around this week. 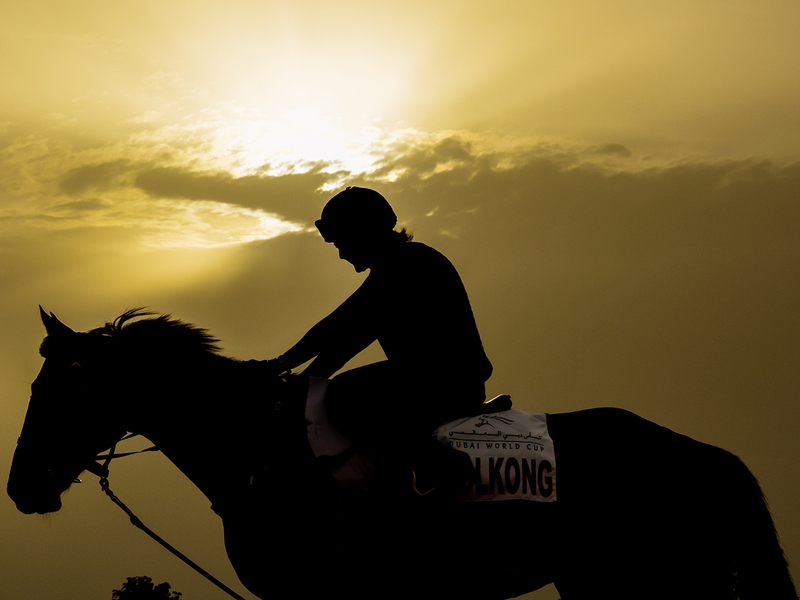 Racing in South Korea is gaining in popularity with huge crowds in attendance on weekends and competitive prize money on offer for connections. Foster still feels if South Korean racing is to go places nothing will work better than a horse like Dolkong winning horse racing’s most lucrative event. “Prize money in Korea is third highest in Asia I think, but they’re looking for more international recognition and they want to go to being a Grade 1 country and it’s going to take time,” Foster said. In his four runs in the UAE, Dolkong placed third twice, either side of his stunning nine-and-a-half lengths win in the Listed Curlin Handicap over 2,000 metres, the distance he’ll run on Saturday. Foster knows his charge will have to step it up several notches to make an impact. He said: “The horse amazes me. He looks nice and quiet on the track, but he’s a tough competitor and every time we put him out on the track he will give his all. “He doesn’t understand what he’s doing but he just does it naturally and that just gives us the best and we are just very proud of him. “This is the hardest race on his calendar and his form is peaking at the right time and every run he’s put in he’s improved and he’s gonna have to do it again and we are mindful of that. “He just keeps on lifting the bar and taking it on and I’m really happy he’s going into the race the way that he is. “I actually feel more pride for the horse than anything. Because if it wasn’t for the horse I would not have been able to do it. For him to be able to step up like he has, he’s done a fantastic job for me and I’m just pointing the finger at the moment.